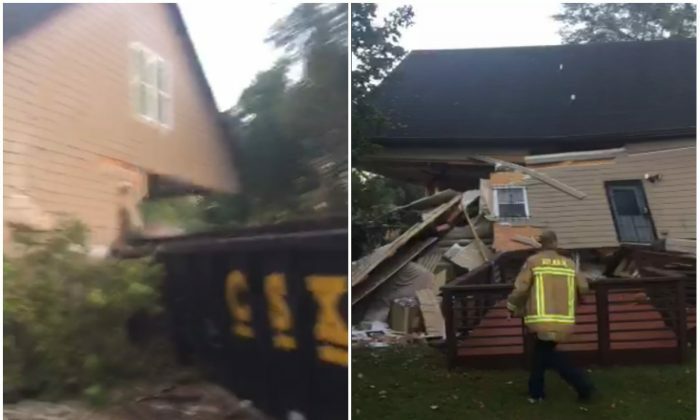 A freight train derailed and crashed into a south-west Atlanta home on Thursday, Oct. 5. One man inside the house was transported to a hospital, but was in stable condition, according to Sgt. Cortez Stafford, Atlanta fire department spokesman. About 14 of the almost 200 train cars derailed near Andrews and Eason Streets at about 3 a.m. The cars rammed into a two-story house and knocked it off its foundation. The train belonged to the CSX Corporation. The train was traveling from Waycross to Cincinnati, Ohio. It had three locomotives, 68 loaded cars, and 123 empty cars, he said. The crash sounded like an explosion, said Tomaya Tucker, a neighbor of the injured man. She ran out to check what happened. “I was scared. Scared for them,” she said. She said the idea that one of the trains that passed by several times a day would come off the tracks never crossed her mind. She said the man just had the house fixed after trees fell on the house during a tornado. “That’s sad. That house is too beautiful for something happening like that,” she said. Almost 800 people died last year in more than 11,000 railroad-related incidents, according to the Federal Railroad Administration, including crashes and derailments as well as people struck by trains.